This is a wiggle expression that allows to wiggle not in all directions simultaneously, but only in one direction that can be specficied via some angle. This expression can only be applied to 2D properties like the position or anchor point of a layer. 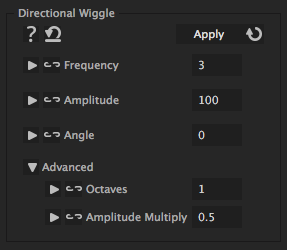 It has the same parameters as the 'Basic Wiggle' but in addition you can specify the direction in which the expression should wiggle. If you want to wiggle not only in one direction but want to wiggle differently in different directions (like to wiggle stronger up and down than left to right) you should also look at the Separate Wiggle 2D. Angle in which the position should wiggle (in degrees). 0 degree means to wiggle up-down, 90 degree means to wiggle left right and 45 degree wiggles along the diagonal, for example.